Intel is building the first exaFLOP supercomputer for the U.S. Department of Energy, powered by Intel Xe. Coming in at over $500 million, the Intel and Cray Inc. Aurora machine will utilise the very latest technology, including Intel’s unreleased and untested Intel Xe graphics architecture, to deliver unprecedented performance in both high-performance and artificial intelligence workloads. 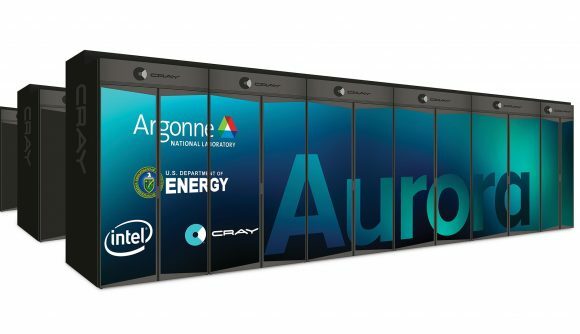 The DOE will be running Aurora at the Argonne National Laboratory in Chicago, its quintillion floating point computations per second working towards improving “extreme weather forecasting, accelerating medical treatments, mapping the human brain, developing new materials, and further understanding the universe.” But can it run Crysis? It probably can. That’s because Aurora will also see Intel roll out its Intel Xe graphics tech, the graphics architecture powering the company’s first discrete graphics card in 2020, on a mass scale. Intel has always planned on targeting everything from integrated right the way up to datacenter and AI graphics with Intel Xe, and the Aurora supercomputer, to be delivered in 2021, will be another ambitious target for Intel’s dev team. We haven’t heard a great deal about Intel’s Xe architecture, but we do know that it will be built upon the building blocks of its Gen11 integrated graphics soon to be fitted into Intel Ice Lake CPU silicon. Gen11 iGPUs will be built upon the 10nm process node, allowing up to 64 EUs and doubling performance-per-clock of the previous, 24 EU, iGPUs found in today’s 14nm processors. But because so little is known about Intel’s Xe architecture, the fact alone that the DOE is prepared to spend $500 million on it is noteworthy in and of itself. Either Intel is awfully proficient in The Art of the Deal, or its proved Intel Xe, in the labs, is worth the investment. With that 2020 launch window fast approaching, Intel must have something to show for its hard work by now. Intel’s also fitting Aurora with a future generation of Intel Xeon Scalable processors, likely a 10nm architecture by today’s roadmaps; Intel Optane memory, and Intel’s One API software. All of that will be pieced together by Cray into over 200 cabinets, and Cray’s high-performance interconnect. Mellanox will be green with envy… because Nvidia just acquired the HPC networking company for $6.9bn. Moving swiftly on.